Australia is relatively rich in its native orchid population with over 750 different species. Two thirds of these grow in the ground – the terrestrials, and one third on trees or rocks – the epiphytes or lithophytes. The major populations occur along the eastern seaboard in New South Wales and Queensland, in Victoria and south-eastern South Australia and in the south-western corner of Western Australia. Some species extend across northern Australia and others to the west of the Great Dividing Range but few are found where the rainfall is below 400 mm per year. A strong Asian and New Guinean influence is found in the orchids of northern Queensland. This decreases as we move south and is totally absent in southwest Western Australia. Between southeast Australia and Tasmania there is a similarity with species found in New Zealand. Many terrestrial species and in some cases whole genera are endemic to Australia. Many terrestrials grow with a specific fungus in a shared relationship. This is referred to as symbiosis. If that particular fungus is lost, the orchid dies, which explains why so many terrestrials are difficult or impossible to maintain in cultivation. 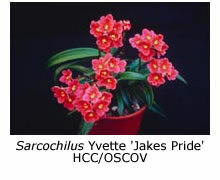 Flower size is generally small (commonly 50 to 200 mm across) compared to the commonly seen exotic orchids, such as Cattleya, Cymbidium, Phalaenopsis etc. However this is adequately compensated by their great diversity in shape, colour and delicate perfume. Every colour is represented in the terrestrials including black and blue, and their diversity in shape is incredible. 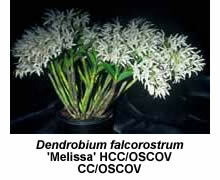 Flower count varies from one in some species to over one hundred per stem and many thousands per specimen plant. The smallest of all flowers is found in the genus Bulbophyllum, where the whole flower of some species is only a few millimetres across. The majority of native orchids flower in spring. However, there are many that flower at other times and some flower more than once a year. Flowering time depends on latitude for widely dispersed species, being earlier in the north and at lower altitudes. 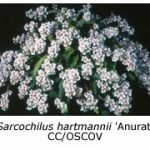 Although common names are frequently used by the layperson or orchid-newcomer, the botanical name is to be preferred. 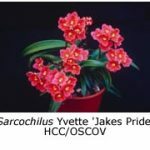 Initially this often appears daunting but once mastered the botanical name is totally specific, compared with a common name, which may describe different orchids in different areas. Thus the term spider orchid is commonly applied to many different orchids throughout the world, but if we mean the particular spider orchids that grow across southern Australia we use the name Caladenia. 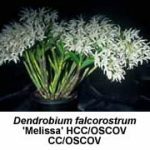 This is equivalent to our surname, and to distinguish between the various spider orchids we use a further name equivalent to our given names, e.g., Caladenia dilatata, Caladenia carnea etc. Other examples include the donkey orchid – Diuris, the greenhood – Pterostylis, the waxlip orchid – Glossodia, etc. The terrestrials are found especially in the southern states, including Tasmania, but also extend up the eastern seaboard. Moisture and sunlight are the most critical factors governing their growth and flowering, so that they are usually found in open forests, natural grasslands, coastal heaths and swamplands. 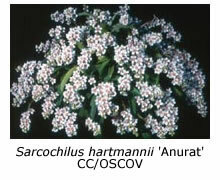 They are generally found in poorer soils, because the undergrowth and trees commonly overgrow them in richer soils. Areas with a rainfall of at least 750 – 1000 mm per year are preferred, although some species are found in the Mallee and the alpine areas. The terrestrials grow from a fleshy tuber and have a definite annual cycle, controlled mainly by soil moisture. 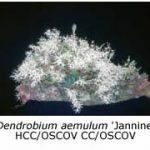 Following a dry period, generally the summer, and under the stimulation of increased soil moisture, a shoot forms, grows through the surface of the soil and develops leaves and commonly a flower stem and flower, prior to dying back in the late spring. If fertilization occurs this process is extended whilst seed is produced and dispersed. Prior to dying back, the next season’s tuber is produced, and with colony orchids several tubers are produced. 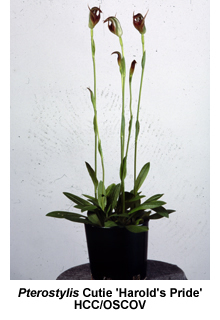 These colony-forming orchids, such as Pterostylis, Diuris, Chiloglottis, etc., are those most easily introduced into cultivation. They may be grown in shallow containers in a mixture of equal parts of well-decayed humus, coarse river sand, and friable bush loam. The tubers are planted (preferably during the resting phase) to a depth of 30 – 50 mm and the surface covered with coarse sand or Casuarina needles. Enough water is provided during the resting stage to prevent desiccation, and this is increased during the growing stage. Perfect drainage is essential and nylon fly wire placed in the bottom of the pot helps to prevent pests entering and damaging the roots and tubers. Tubers may be lifted each year or left undisturbed. They may only be collected from their natural habitat on private property, with the owner’s permission. It is generally best to remove the natural soil and replant them in the suggested mix. The species most suitable for hobby cultivation are Pterostylis nutans, Pterostylis curta, Pterostylis pedunculata, Diuris pedunculata, Diuris maculata, and Chiloglottis gunnii. 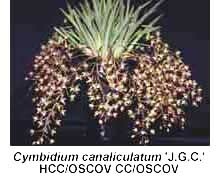 With more experience, other species from these genera and also Spiranthes, Thelymitra, and Caladenia may be attempted. 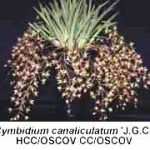 Do not attempt to grow Caladenia, Glossodia or Prasophyllum species or Dipodium punctatum, as they are all difficult or impossible to maintain in cultivation. Terrestrials may be grown without any heat in all states, all the year, either in the garden or in a bush house. They prefer 50% shade, adequate air movement and a weak fertiliser during the growing season. Avoid frost and be on constant watch for snails, slugs and aphids. The epiphytes and lithophytes are found mainly in the tropical rainforests of northern Queensland and from southern Queensland to northern and mid New South Wales. Only five species extend into eastern Victoria, two into Tasmania and three across to northern Western Australia. 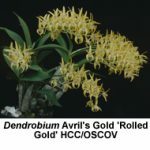 Some, such as Dendrobium falcorostrum and Sarcochilus fitzgeraldii, are found in relatively confined areas around the Queensland/New South Wales border. 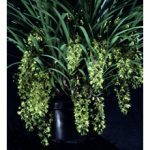 Others such as Dendrobium speciosum and Cymbidium suave extend along the full eastern seaboard, while Cymbidium canaliculatum extends across northern Australia. Mean temperature is the main determining factor that controls their range. True epiphytes use the trees or rocks simply for support and gain their nutrition from the humus that collects about their roots or from minerals dissolved in the water that passes over them. 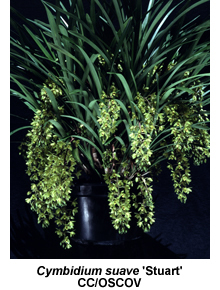 They are the native orchids most amenable to cultivation, especially Dendrobium, Cymbidium and Sarcochilus species. 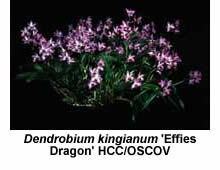 Dendrobium is the major Australian epiphytic genus with over 50 species. Within this there are two major groups. 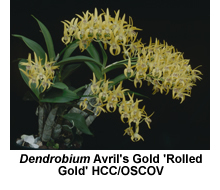 The warm growing includes Dendrobium bigibbum (the Cooktown Orchid) and Dendrobium discolor (the Antelope Orchid), while the cool-growing group includes Dendrobium kingianum (the Rock Orchid), Dendrobium speciosum (the King Orchid) and the fleshy-leafed variety Dockrillia teretifolia (syn. Dendrobium teretifolium, the Bridal Veil Orchid). The warm-growing varieties require a heated glasshouse during the winter in the southern states, whilst the cool growing species may be grown in a shade house. 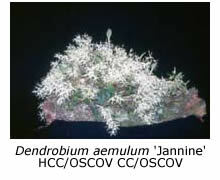 Epiphytes may be grown either on a slab or in a suitable potting mix. Some may be grown either way. With slab culture a stable surface must be provided. Thus well-weathered hardwood or tree fern, cork or various stable fissured barks such as Casuarina or Melaleuca may be used. If a plant is not already established, it must be fastened to a suitable slab with nylon cord or galvanised staples. The root area should be covered with a wad of Sphagnum moss during the initial stages. It is essential that the plant be firmly secured at this stage so that movement cannot damage the root tips before the roots have had time to adhere to the slab. The slab is then hung in a well-ventilated area with 30 – 50% shade, and watered and fertilised during the growing season. At this time water should be applied copiously and then the root area allowed to partially dry before the next watering. During the cooler months watering should be decreased in proportion to the activity of the plant. Container culture is more appropriate for cooler-growing dendrobiums and their hybrids. terracotta saucers with holes added, squat plastic pots, baskets and even hollow logs are appropriate, provided drainage is adequate. A suitable compost is made from 3 parts of 5 – 8 mm weathered pine bark and 1 part of coarse river sand. Re-potting should be done in the warmer months after flowering, when active new growth begins. Provide 30 – 50% shade together with adequate air movement. Regular fertilising with a balanced fertiliser provides for optimum culture. As with slab culture, water copiously during the growing season and taper this off during the cooler months. Rapid development is occurring in hybridizing programmes involving native dendrobiums and excellent results are being achieved. 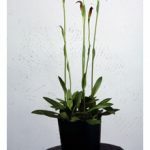 Older hybrids are being re-made with superior parents and new hybrids are being developed between the Dendrocoryne and Phalaenanthe groups. These are yielding cooler growing plants that have larger flowers and a wider colour range. These hybrids provide an exciting challenge for those willing to try to grow them. 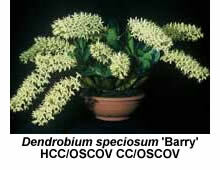 The native cymbidiums and sarcochilus are amenable to culture but are generally not as easy to maintain in cultivation. Of these Sarcochilus hartmannii is probably the best one to try first. With sarcochilus hybrids, the use of the totally purple-red cultivar Sarcochilus fitzgeraldii ‘ Lorraine’ and species such as Sarcochilus hirticalcar are opening new horizons. 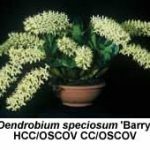 As well as the above type of culture, dendrobiums especially may be grown in the garden in specially prepared beds, or on rocks, stumps or trees. 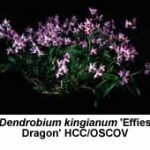 Those suitable for garden culture include Dendrobium kingianum, Dendrobium speciosum and Dendrobium falcorostrum and many of the hybrids between them, such as D. Bardo Rose, D. Delicatum and D. Hilda Poxon. They require a position that provides morning and early afternoon sun, with protection from the hot afternoon sun, drying winds and frost. In time these plants will grow to specimen size and provide dramatic displays during the flowering season. Some species are threatened with extinction due to man’s encroachment into their natural habitats. Hopefully, adequate nature reserves will be established for their preservation. Where appropriate, the collection and cultivation of some of these unique gems may be necessary if they are to survive and be enjoyed. Selected outcrossing of choice clones is also very appropriate and superior clones are resulting from this approach. Native orchids are part of our natural heritage and together with recent advances in hybridisation for colour, shape and multiple flowering time, combined with their delicate perfumes and massed flowering displays, they provide a most desirable addition to any collection.